It is relatively common for homes in Georgia to have basements. A basement is a beneficial portion of a home where people can store seasonal items (e.g. a Christmas tree), things they do not use very often, or mementos that they keep for sentimental reasons but do not want cluttering up their living spaces. While basements are great features of a home, they are often put “out of mind” if people do not regularly spend a good deal of time in them. Moisture problems are common concerns in basements, and preventing them and fixing them early is vital for avoiding costly repairs. Basements are notorious for moisture problems mainly because they are below ground level. Groundwater and rain cause for the accumulation of a great deal of standing water at and around a home’s foundation. Poor irrigation and improper foundations often deposit groundwater around and under basements, leading to excessive moisture buildup. It is important to keep an eye out for any standing water around your home’s exterior in order to prevent serious foundational problems as well as having moisture seep into your basement. Another cause of moisture accumulation and moisture problems in the basement stems from water problems inside the home. Many people forget that showers, laundry machines, dishwashers, humidifiers, and other appliances create moisture buildup. Plumbing issues are often associated with homes that are well-ventilated with excellent plumbing. Water and moisture can accumulate behind walls, in crawlspaces, and along pipes and seep down into the basement. This type of moisture issue often causes serious damage because, without a noticeable leak, moisture can build up significantly over time and wreak havoc on your basement. While season changes in Georgia are relatively gradual, there are times when crazy weather hits. If the transition between temperatures happens too quickly, the interior and exterior of a residential home often does not have time to adjust. This creates problems with condensation and moisture buildup. 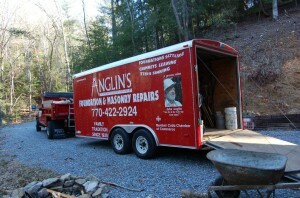 At Anglin’s Foundation & Masonry Repairs, we can address the foundational problems caused by moisture buildup in your basement. If your home’s foundation is compromised in any way, please do not waste a moment in contact us. We are the foundation experts in Georgia.